From helmet to boots, kids add color to a firefighter's turnout gear with the ALL-NEW Firefighter Coloring Pad! Kids are fascinated by turnout gear and love learning about how firefighters stay safe in a fire. 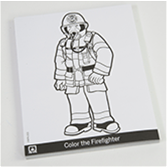 NFPA's new Firefighter Coloring Pad is a fun way to familiarize young children with the protective gear firefighters wear at work. Coloring the firefighter's special gloves, helmet, facemask, boots, radio, and flashlight opens the door for classroom discussion about how firefighters fend off fire hazards so they can help people in the community.